Click on the image above or the image below to see more detail. A different kind of gamble. “Painting is a gamble, all or nothing“, Gauguin. During the Admiral’s Cup contest at Cowes, while I was sketching at Cowes Week, I made the “lucky” choice of “Corum Saphir” as a subject for my next painting. I was looking for colourful, successful, distinctive yachts in actinion. “Corum Saphir” was sketched and photographed in rough seas from the fore deck of the official press boat, When back home in Plymouth, painted her. A French success; “Corum Saphir” won the Fastnet and lead her team to win the very prestigious team event, the Admiral’s Cup, the first time for France. 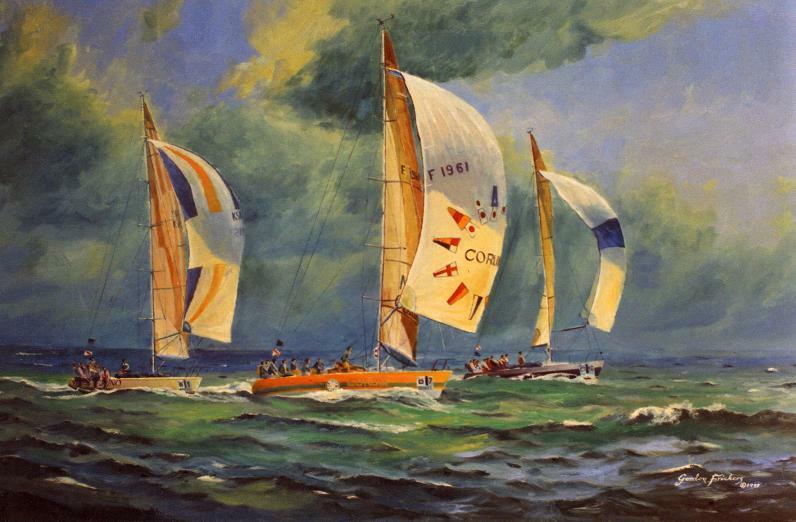 This fine atmospheric original was bought by Corum off the quay side at Queen Anne’s Battery Marina, Plymouth, after “Corum Saphir” won the renowned Fastnet Race. Some where I still have my notes, photos and sketches... souvenirs of a great week and a fine spirited painting. You can purchase securely via our ‘Payments Page’ using Paypal or bank to bank.